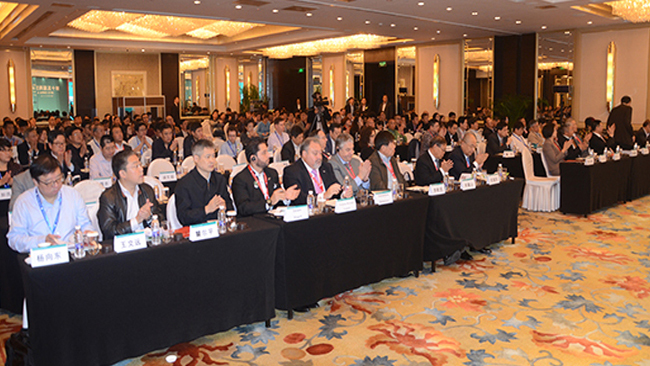 With your support and participation, 2015 CMRA Annual Convention, held in Shangri-La Hotel Ningbo, China during 7-9 Nov., has been successfully concluded. Please accept our sincere thanks and gratitude! CMRA Annual Convention, hosted by CNIA and organized by CMRA, has been trying to become an internationalized platform for the global nonferrous metals industry and 2015 CMRA Annual Convention has attracted about 1500 participants from 36 countries and areas such as USA, UK, France, Germany, UAE, Australia, Spain, Poland, Netherlands, Canada, Singapore, Japan, Switzerland, Finland, Italy, Bulgaria, Austria, Oman, Saudi Arabia, Sweden, Greece, Mexico, Honduras, Lebanon, Belgium, Cyprus, Denmark, Romania, Israel, Korea, Lithuania, Latvia and China mainland, Hong Kong and Taiwan etc. National Development and Reform Commission of China, Ministry of Industry and information Technology of China and Ministry of Environmental Protection of China attended the conference and gave the report. Representatives of BIR, ISRI and BMR also joined the convention and gave their presentations. The exhibition area covers 7000 square meters. 54 exhibitors have their booths, one third of which come from overseas and two fifths are equipment enterprises. Metal scrap recycling, dismantling, smelting, deep processing, trading, shredding, selecting and environmental protection are all covered. During the exhibition, key technology and equipment promotion, trade docking, supply and demand information release and industrial chain enterprises list release attracted about 100 enterprises in total, providing more opportunities of exchange for exhibitors and participants. After the Convention, more than 130 domestic and overseas participants attended the site visiting to Ningbo Jintian Group Co., Ltd, Ningbo Zhanci Metal Industry Co., Ltd, Ningbo Changzhen Copper Co., Ltd, Ningbo Shimao Copper Industry Co., Ltd, Taizhou Circular Economy Industrial Zone Recycling Metal Park, Taizhou Chiho-Tiande Metals Co., Ltd, Zhejiang Judong Co., Ltd, Zhejiang Jingcheng Renewable Resources Co., Ltd, Zhejiang Dasenya Environmental Protection Co., Ltd.
2015 CMRA Annual Convention has been widely accepted by the exhibitors and participants, and 32 enterprises including Engitec Technologies SpA Asia, Sigma Group, Shandong Tian Yuan Copper Industrial Co., Ltd, Ye Chiu Metal Recycling (China) Ltd, Lizhong Group, Lucky Group has booked booths on 2016 CMRA Annual Convention. Please accept our sincere thanks and gratitude again for your support to 2015 CMRA Annual Convention! 2016 CMRA Annual Convention will be held in Dongfang Hotel of Guangzhou during Nov. 7-9, 2016 and your continuous support will be warmly appreciated! If you have any suggestion and advice, do not hesitate to let us know.